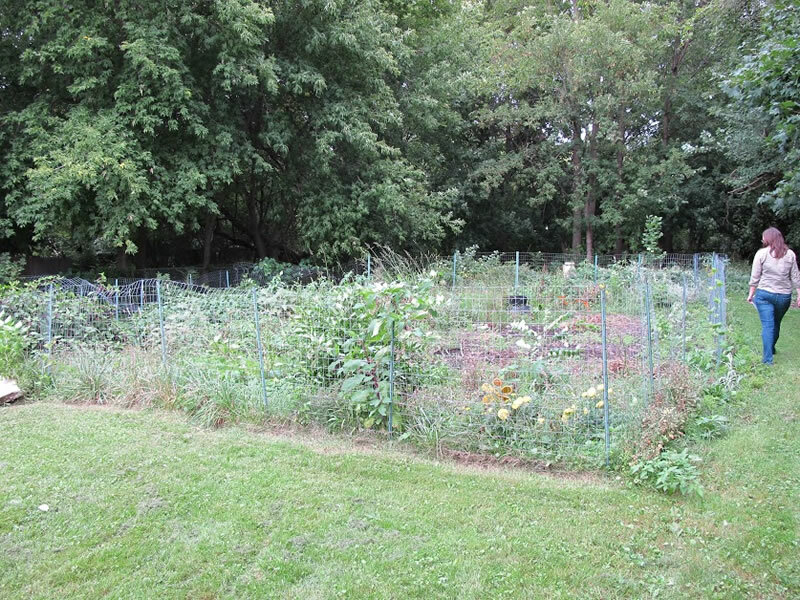 The 341 Midland Avenue community garden is a narrow lot owed by the Land Bank. Half of it is wooded and bordered by Onondaga Creek on the east. Between the wooded portion and garden itself is the Syracuse Grows’ tool shed. Its roof runoff empties into two rain barrels which provide the water for the garden. Next to the shed is an unfenced open garden where we plant what the ground hogs don’t eat – garlic, potatoes, rhubarb, hot and sweet peppers, onions, potatoes, tomatillos, raspberries, basil, mint, thyme, oregano and rosemary. Next to the open garden (towards the road) we have eight 12’x4’x4′ raised beds built with Gifford Foundation “What If” grants. Each is surrounded by welded wire fencing to keep the ground hogs from climbing in and helping themselves. In these beds we plant collards, lettuce, cilantro, parsley, kale, chard, arugula, turnips, carrots, okra, eggplant, tomatoes, beans, spinach, cabbage, broccoli, and strawberries. On the south side of the lot we have two picnic tables, a work table and two chairs. And facing the street we have a community garden sign. Currently, we have about eight people working most Saturdays during the growing season from 9 – 11 am. We share the produce with each other. Some are from the neighborhood and others are friends who love to garden. Those that can donate $25 towards keeping the lot mowed. A neighbor mows the lot twice a month for us. In 2016, a local environmental justice group the Partnership for Onondaga Creek will teach gardening once a month to city youth 11 – 14 years. Please contact garden coordinator Aggie Lane to find out more about getting involved at this garden.